Suzuki Gixxer has a really neat and slim design to it which when lined up against the FZ, one cannot disagree with the similarities between the two. 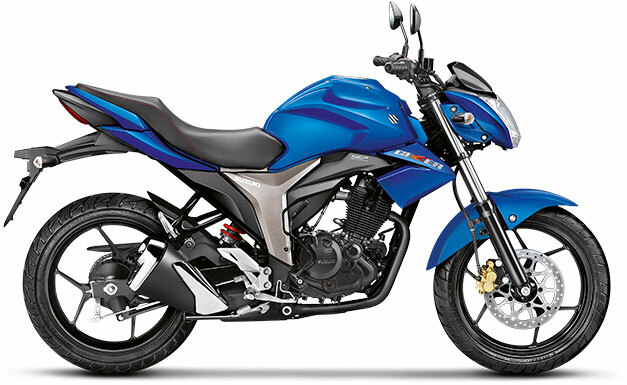 Gixxer has a muscular tank and a high set handlebar makes for a comfortable riding position. My favorite part about the Gixxer is the double barrel exhaust which now comes with a futuristic cover to it. On the other hand the Hornet looks muscular and bulky for the power it packs. The handlebar on the Hornet is high set too and seating position is comfortable. The rear end of the hornet gets an X-shaped tail lamp which steals the show when looked at it from the rear.While the Gixxer does not have a great rear end to look at. The winner in the looks category is the Hornet and the build quality on both the bikes are equally good. The plastics on the Gixxer are a little ahead of that on the Hornet. One negative of the hornet is the absence of the engine kill switch. We would let it go if the bike was introduced 5 years ago but in this present world and the competition that’s happening, an engine kill switch would really add to the advantage of the bike and also attract the buyer for the convenience it offers. Gixxer comes with a single cylinder, 154.9 cc engine which makes 14.8 bhp @8000 rpm and a torque of 14 Nm, while that of the Hornet is a 162.7 cc engine making a power of 15.6 bhp @8500 rpm and a max torque of 14.76 Nm. Both the engines are close with specs and the Hornet holds the upper hand in the power with roughly 1 bhp more than the Gixxer’s. Gixxer’s power is delivered earlier than that of the Hornet’s which evens out the two. Power from the Gixxer is as instant as it can get while the Hornet delivers it in a very relaxed manner. The power to both the bikes are delivered through a 5 speed gear box. Gixxer maxes out at a top speed of 115 km/hr which is 6 km/hr faster than the Hornet’s 109 km/hr. Wheelbase of Gixxer is at 1330 mm and that of the Hornet comes at 1345 mm which makes it 15 mm more than the Gixxer. 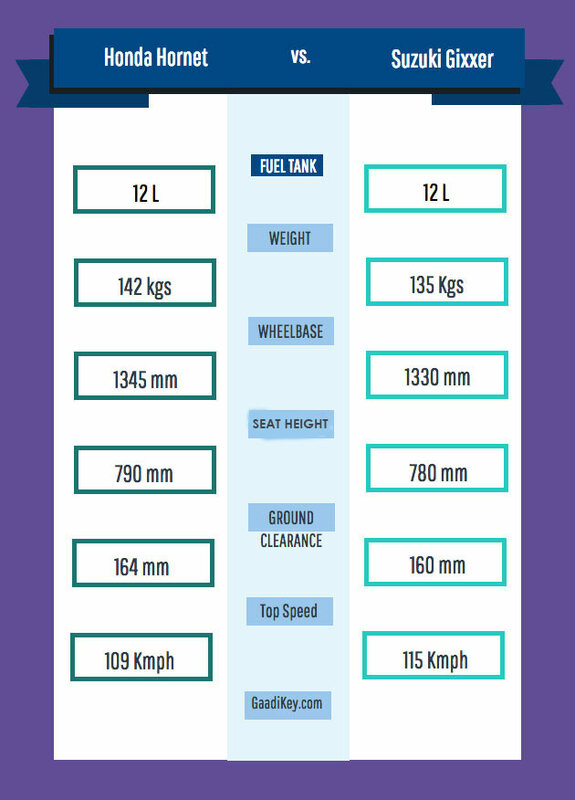 Gixxer has an advantage of being 7 kgs lighter than the Hornet which weighs at 142 kgs. Although, Hornet wins with having a ground clearance of 164 mm compared to the Gixxer’s 160 mm. There’s just 10 mm difference in the seat heights of the two being 780 and 790, hornet’s being higher. 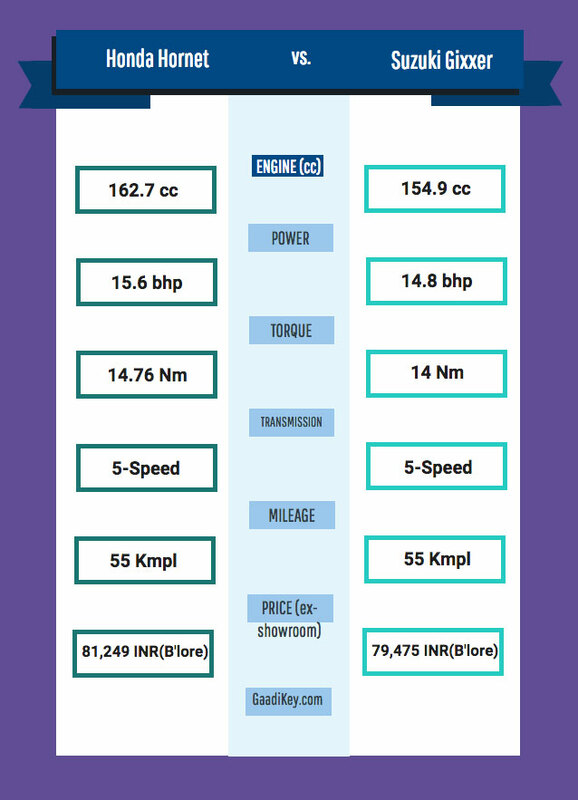 Fuel tank capacity of the two are the same with 12 litres and handy for touring while both bikes give an impressive mileage of 55 kmpl on the highway. This means you can go 660 kms without having to stop for a fuel station in the middle of your trip. Gixxer does braking with a 266 mm disc up front and a 240 mm disc in the rear. The Hornet adopts the combi-brake system which is not desired by some people because of both the wheels getting locked while applied either the front or the rear brake. 276 mm disc up front and a 220 mm disc in the rear do the job for the Hornet which come under combined braking category. Suzuki Gixxer is priced at INR 79,475 for the STD version and INR 80,493 for the rear disc version, both prices ex-showroom Bangalore. 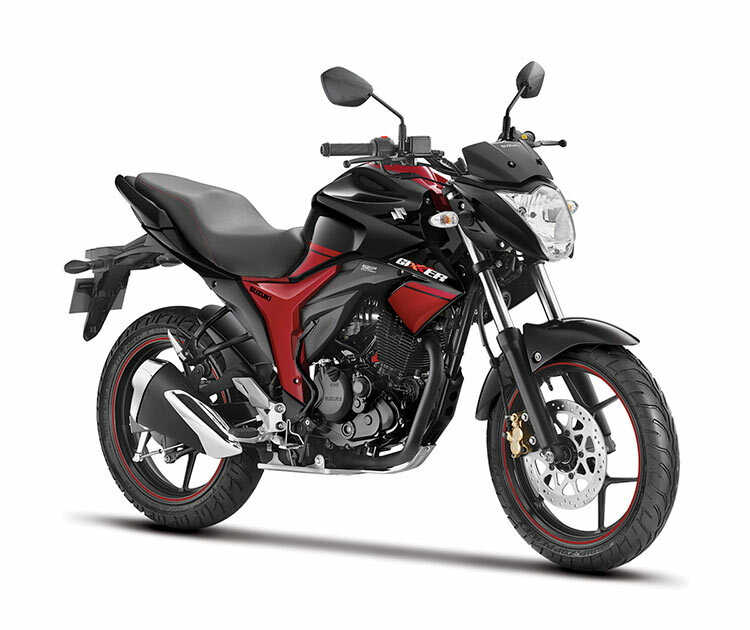 The ex-showroom Bangalore price of Standard version of Honda CB Hornet 160R is INR 81,249 and the CBS version of the bike is INR 85,749. Pretty recently Honda introduced 2 new colors for Hornet – Mars Orange and Striking Green. Honda Hornet vs Suzuki Gixxer – Which one to choose? 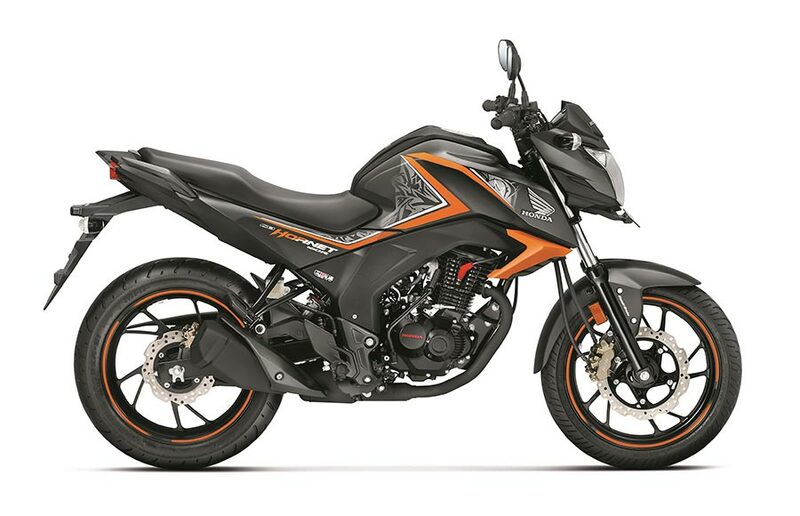 Both these bikes are well priced and are heavy competitors against each other and in the 150 cc segment category. Both these bikes feature similar engine types and are good looking 150 cc bikes. Making a choice between the two may be a difficult given the way they both behave and the way they pose. But I personally feel the Gixxer inches just ahead of the Hornet in terms of how it behaves on the road and the quality of plastic it packs (first impression after test riding the bikes).